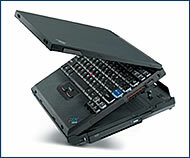 IBM strips considerable weight from its ThinkPad notebook series with the X30. Weighing in at 1.6 kg, it’s capable of stretching battery life to eight hours if equipped with an optional second battery that attaches to the bottom of the unit. Available for CZK 78,270. 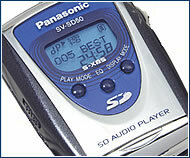 Panasonic’s compact and affordable SV-SD50 music player includes a 64 MB memory card capable of storing roughly an hour’s worth of MP3s, LCD display, and 30 hours of playback using one AAA battery. CZK 6,995. 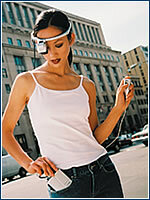 Xybernaut, a US-based technology firm, has released the Poma, a novelty computer with a wearable headband display. The PC component can be clipped to a belt, and contains 32 MB of RAM and Microsoft Windows CE operating system. Available at xybernaut.com for CZK 45,700. Logitech has released a digital camera roughly the size of a credit card, and weighing only 54 grams. The Pocket Digital can store 52 high-resolution images, transferable via USB port. 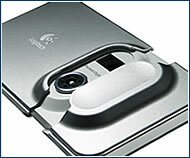 Compatible with Windows 98, 2000, or ME, it’s available at logitech.com for CZK 4,000. 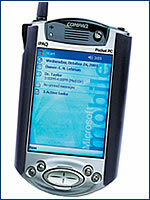 HP has dressed up the iPaq PDA into a mobile phone hybrid. The new Wireless Pack enables the iPaq to transfer voice and data via GPRS, as well as performing traditional functions as a pocket PC equipped with internet and e-mail. Available for CZK 15,980.